The ability to transform ordinary ingredients into a broad range of gastronomic delights is a skill that award-winning Chef Shanmugam Rajoo (Chef Shan) is eager to impart. As INTI College Sarawak’s new Resident Chef Lecturer, Chef Shan has excellent resources at his disposal and these include the world-class kitchen facilities at Borneo Convention Centre Kuching (BCCK) where he conducts his practical classes. Enthusiasm is written all over the faces of Chef Shan (back row, centre) and his proteges. Having worked in the United Kingdom for over nine years as a chef in choice establishments such as The Soho Hotel in London, The Holiday Inn, Ealing and The Chula Bar and Restaurant in Hammersmith, Chef Shan flavours his Fusion Cuisine, Western Cuisine and Garde Manger courses with experience and know-how gained through competitions and working with other professionals in the culinary arts field. “I want students to acquire not only solid culinary skills but also a strong business foundation through the Diploma in Culinary Arts programme,” said Chef Shan, who has won awards at the Hammersmith Council Culinary Cooking Competition in the UK and Culinaire Malaysia Cooking Competition at the KL Convention Centre. “They will learn cooking skills and techniques that will prepare them for fine-dining kitchens and other food service operations. I also impress upon my students the need to tap their individual wellsprings of creativity and perseverance which are essential in honing their culinary skills,” he added. Students preparing tasty fare as part of their practical training at BCCK. 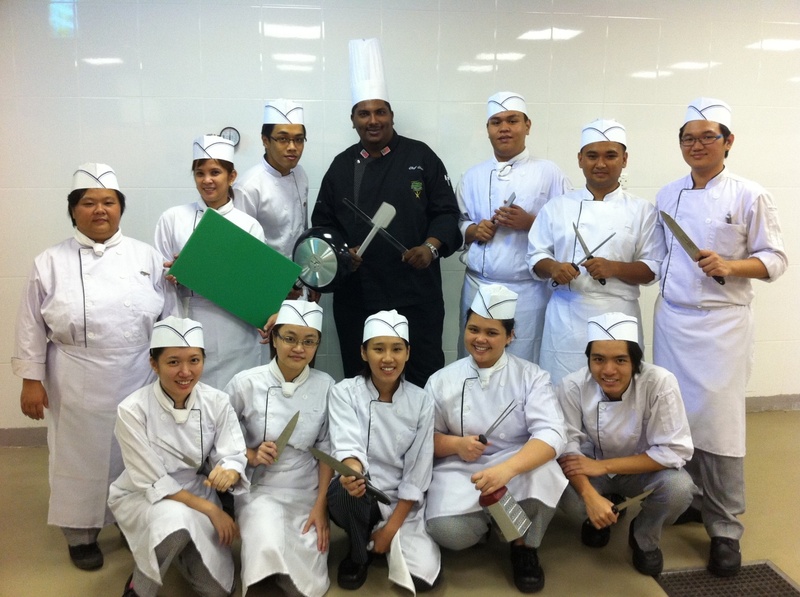 INTI’s Diploma in Culinary Arts programme is a window of opportunity to vibrant and exciting careers in culinary arts. The curriculum allows students to gain relevant knowledge and techniques in diverse areas that include Menu Planning, Food and Beverage Management, Food Safety Management, Event Management and Marketing. With the recent formalisation of a synergistic partnership between BCCK and INTI College Sarawak, INTI students have access to BCCK’s world-class kitchen facilities. They also benefit from industrial placement opportunities or internships with BCCK, where they will be directly exposed to global best-practices in relation to the MICE (Meetings, Incentives, Conventions and Exhibitions) industry. Together with INTI College Sarawak’s new on-campus kitchen facilities, the learning experience of the students will be further enhanced, especially in the areas of Practical Cookery, Garde Manger and Pastry and Bakery. Graduates of the Diploma in Culinary Arts programme can opt to pursue degree programmes at prestigious institutions under the Laureate International Universities network, which include Glion Institute of Higher Education, Switzerland, Les Roche International School of Hotel Management, Switzerland and Blue Mountains International Hotel Management School, Australia. Students of INTI benefit not only from its over 25 years of experience and strong track-record, but also gain from the global synergy and resources that Laureate International Universities provides. INTI is part of Laureate, the world’s largest private education network with a presence in 29 countries, with more than 60 accredited universities and 130 campuses, serving more than 675,000 students globally. The Diploma in Culinary Arts programme is open to school leavers who have a minimum of 3 SPM credits and at least a pass in Bahasa Malaysia, or at least 3Bs in UEC. Classes for the April 2012 session will commence on 9 April 2012. For further information, please call 082-570888 or visit INTI College Sarawak at Jalan Stampin Timur in Kuching.